PM Hotel Group announced the arrival of Lance Mion as chef and drink lead enthusiast of the Canopy by Hilton located at Pike & Rose. Mion has been in the industry for more than 25 years, including stints at the Westin Georgetown Hotel and St. Regis Hotel. The menu at Canopy Central, the hotel’s restaurant, will remain largely unchanged, Mion said. He plans to expand the current selections and add a few promotions, such as an expanded happy hour menu and Sunday brunch. The restaurant will focus on comfort-style food, along with additions based on the season, Mion said. Oyster stew and crab bisque will be added for winter, with changes also coming to the seasonal drink options. Instead of discounted menu items, Mion will introduce tapas-style fare for happy hour, including nachos and rockfish tacos. The adjustments are meant to create a more welcoming environment for the nearby community. 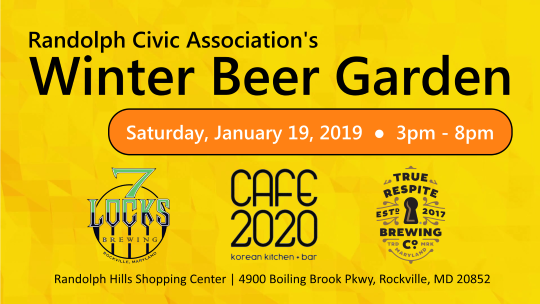 You won't want to miss The RCA Winter Beer Garden held at the RCA Civic Green at Randolph Hills Shopping Center, Saturday, January 19th, 3pm to 8pm. The RCA is excited about this new partnership, as it is a fantastic opportunity to pick up where the Placemaking Festival left off. The fire pits and awesome furniture are still on site at the corner of Rocking Horse Rd and Boiling Brook Pkwy, begging to be used for another exciting festival. So mark your calendars: on Saturday, January 19th from 3pm to 8pm, come have a beer or two or three with your neighbors around the fire pit. In addition True Respite, 7 Locks Brewing, and Cafe 2020 Korean Kitchen + Bar will also be at the event and the RCA will set up a tent selling warm beverages, such as Hot Chocolate. Montgomery County yesterday celebrated the resolution of a major shortcoming of Metrorail service in the County as the Red Line “turnback” of rush hour trains ended. All peak hour morning and afternoon trains leaving Washington, D.C., will now travel all the way to the terminus at the Shady Grove station. Since 1984, in a cost-saving move due to a lack of railcars, Metro had every other rush hour train turnback at Grosvenor and return downtown. Among a big crowd of elected officials and community leaders who gathered at the Rockville Metro Station to mark the first day of the schedule change were Montgomery County Executive Marc Elrich; U.S. Senator Chris Van Hollen; Metro General Manager and Chief Executive Officer Paul Wiedefeld; Maryland State Delegates Charles Barkley and Jim Gilchrist; Montgomery County Councilmembers Gabe Albornoz, Andrew Friedson, Evan Glass, Tom Hucker, Sidney Katz and Hans Riemer; Rockville Mayor Bridget Newton; and Montgomery County Director of the Department of Transportation Al Roshdieh. Montgomery County has been actively seeking the operational change for more than a decade. Within the past year, Maryland joined Virginia and the District of Columbia in a commitment to provide additional dedicated funding to Metro. The transit organization used some of those funds to purchase new railcars, leading the Metro Board of Directors to recently voting to end the Grosvenor turnback. The turnaround directly affects commuters from the White Flint, Twinbrook, Rockville and Shady Grove stations—the four stations north of Grosvenor. Elimination of the turnbacks will double rush-hour service, which means there will be trains every four minutes at those stations. Shady Grove is the second-busiest station in Montgomery County (Silver Spring is the busiest) with more than 11,500 average weekday boardings. Rather than deal with the turnbacks, some Northern Montgomery commuters have simply chosen to park at Grosvenor. This added more drivers on Route 355 and I-270 in the morning and afternoons. The turnback elimination should take some traffic off stretches of the roads as those commuters may now choose to park at other northern Red Line stations. One of these fun New Year's activities is sure to be the perfect one for you! Enjoy a night of dinner, drinks, live music and a complimentary champagne toast at midnight. No Cover Charge. Join Owen’s Ordinary on New Year’s Eve for a rollicking night of revelry featuring far too many brews, fine food, mirth and merriment as we bid farewell to 2018 in style. The theme again is all things Steampunk for our third annual NYE fete. *ALL INCLUSIVE* tickets provide an open bar featuring an impressive selection of some of our favorite brews, as well as select liquors/cocktails and wine, plus a champagne toast at midnight. Our chef and his culinary team will serve a savory cocktail party menu of hors d’oeuvres and savory bites throughout the evening and the DJ will make sure the dance floor is steampunk pumping all night. Learn more about the redevelopment of Nissan property on Old Georgetown Rd. Old Georgetown SAAB Property and Old Georgetown Nissan Property, LLC invites the community to attend a meeting to review plans for the redevelopment of Lot 9, former VOB Saab; Lot 10, former Capital One Bank branch; Lot 5, former VOB Nissan dealership; as well as undeveloped parcels (Parcel 613 and Parcel 614) and certain contiguous portions of the existing road right-of ways in Rockville, Maryland. The Property is located at 5995 Executive Blvd., 11565 Old Georgetown Road, 11575 Old Georgetown and 11605 Old Georgetown Road in Rockville. The Property consists of approximately 5.06 acres of net lot area and is zoned CR-4, C-2.0, R-3.5, H-250. The Applicant will be filing application for a Preliminary Plan with the Maryland-National Capital Park and Planning Commission (“MNCPPC”) for the redevelopment of the Property with a mixed use development with approximately 1,051,012 square feet of gross floor area including: up to 1,000 multi-family dwelling units and 110,169 square feet of commercial development on two lots. In compliance with the County’s Zoning Ordinance, a pre-submission community meeting will be held to share our plans with you and give you an opportunity to provide input. The meeting will be held on Tuesday, December 11, 2018 at 7:00 p.m., at the former Capital One Bank branch building, located at 11575 Old Georgetown Road, Rockville, MD. At this meeting, the Applicant will discuss the proposal and answer any questions. The Applications will be filed with the Montgomery County Planning Board of the M-NCPPC shortly after the meeting. Once filed, the Application will be assigned an application number. For more information about the development review process, please contact M-NCPPC at 301 495-4610 or visit their website at www.montgomeryplanning.org. RSVPs are appreciated, but not required. You may e-mail your RSVP to paharris@lerchearly.com (with “VOB White Flint Community Meeting” in the subject line of your e-mail) or call (301) 841-3832. Escapology will be the first to open at a new, "town center" development. Pike & Rose will be the first such development to lease to an escape room in the County. Escapology will be located on Old Georgetown Road, next to the NAVA Health & Vitality Center. Escapology's escape room games will host up to eight players at once. The first game being offered at the Pike & Rose location is Antidote. Set in 2015 in the Nevada desert, the game challenges you and your teammates to find the antidote to a biological weapon virus that has infected everyone inside a secret facility - after a clumsy member of your team accidentally releases it. Locked inside the contaminated facility, you must locate the antidote and escape before the facility self-destructs. Julii at PIke & Rose opens in two weeks! Julii, one of the most anticipated new restaurants of the fall season, is two weeks away from opening at Pike & Rose. The casual bistro is a side venture from the founders of Cava, who plan to offer a French and Mediterranean menu with dishes like roast chicken and duck, crispy trout, tuna nicoise, French onion soup and Moroccan lamb tagine. “We’re going to start with dinner,” says co-owner Ted Xenohristos. 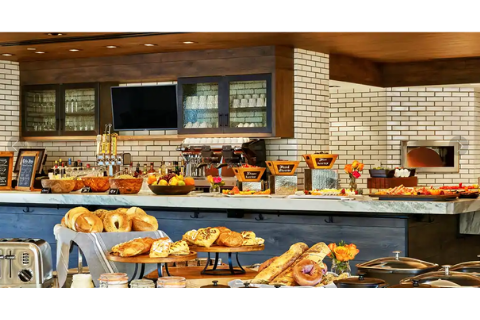 “Eventually we’ll start opening in the mornings with coffee, baked goods, bagels and Israeli-style breakfast, then kick in with lunch service: sandwiches, stuffed croissants and grab-and-go meals.